This short story and its accompanying photographs may be shared in excerpt or in its entirety in electronic, paper, or other format under the condition that it is properly credited, without the knowledge or consent of the author, Liam H. Dooley. There once was a young girl named Brygida. Brygida lived in Cappadocia, Turkey, during a time when Greeks and Turks lived together. Amidst the thousands of chimney stone formations that appeared to be either an upside-down ice cream cone several stories high or a smokestack so large that they contained a family home or a Greek church, Brygida lived a tranquil childhood hunting for ancient treasures or carrying water up ladders to family and neighbors. Her family lived in an especially large and luxurious two-level cave, just beneath the ten-story high fortress of Uchisar – itself carved out of a small mountain, appearing like a thousand-eyed, earth monster with a flat skull on which an Ottoman flag flew.There one was a young girl named Brygida. Brygida lived in Cappadocia, Turkey, during a time when Greeks and Turks lived together. One evening as the sun was setting behind the gold limestone cliffs beneath the cave-fortress, Brygida passed by a carpet stand. It was not one where she was paid a few lira for her cleaning services, and in fact it seemed quite new altogether. The store’s sign was in an Arabic-looking lettering but not Turkish, and there was a funny symbol of a man coming out of a bird’s body with its wings spread wide. It was the symbol of Persia, but of this ancient empire Brygida knew nothing. The carpets shone with a luster that was like stars amidst the sand and rock of the street wound around the fortress, and the colors were a rainbow yanked from the sky. Yet what caught her attention most of all was the fluffy ball of fur that sat in the centre of an especially brilliant red, yellow and blue carpet. 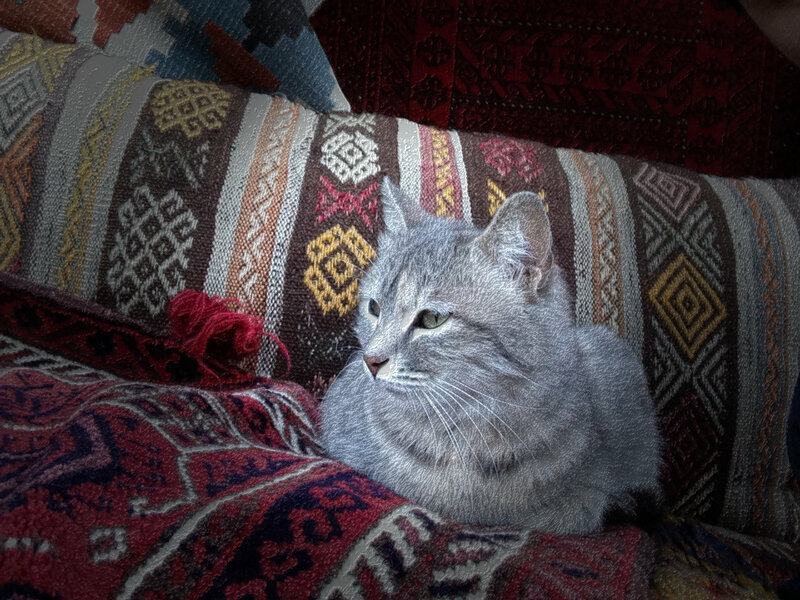 “It is a Persian carpet, as I am a Persian cat. Would you like to visit my home? A Persian cat on a Persian carpet will get you to Persia faster than a mouse can squeal, Let me go!” The cat purred and bent around to look at her back. Brygida didn’t need Rubinka – that was the cat’s name – to ask more than once. Brygida knelt down behind Rubinka, caressing her irresistible gray fur. The sensation was more soothing than feeling her mother’s hair after a nightmare or the feather pillow after a day of picking grapes for wine-making in the valleys in front of the old Greek monasteries carved out of the natural rock cones like her home. The carpet rose into the air. Below, the valleys punctuated by limestone columns, pillars, and cones with their cave openings appearing as dark eyes with fire-red pupils faded below. The shadows of the stubby trees and bushes blended into the darkness of the valley floors. The fires that kept the homes warm and whose lights leaked out into the desert air faded into twinkles just as the stars above became brighter. Brygida felt herself in a bed of stars, and as she stretched out on the carpet the cat became her pillow. Not long after the purring hypnotized her into a deep sleep, she awoke and found herself in a bazaar. It was not much different than one she had seen on her one trip with her parents to Istanbul, but the language spoken around her was wholly incomprehensible. Yet the smell of nuts, bread, tea, and lamb floated throughout the stalls just like it did at home. The cat and the Greek-Ottoman girl stepped off of the carpet and began to walk through the bazaar. Many of the products she saw, however, were like nothing she had seen in her home in the Ottoman Empire. And there were so many lights! Brygida knew of electricity, that flameless light which was quite prolific in the capital, but here there were so many that it was as bright as day in the deepest shop corner. People held little boxes in their hands with moving paintings. The clothes were brighter, the people cleaner, and everyone was taller. “Rubinka, what a strange land!” Brygida exclaimed as she followed the cat into a carpet shop. “Oh, meowsers, the travel carpet did its mousy thing again. It didn’t just go back to my home, but to my home in the future – well your future that is. It is the year 2017, so I guess about one hundred and ten years later than your time.” She licked her paw and then scratched behind her ear. “Oh!” Brygida said while scratching her long, light brown hair as if she, too, was a cat. It was to be her eleventh birthday in just a few weeks, so one hundred and ten years sounded like a million. Were there still oceans and mountains, she wondered? Did horses learn to talk, like she wished her family horse would do? “Well, while we are here, I will show you around.” Brygida followed Rubinka, weaving through crowds, skipping past dogs, and slipping through stores selling all sorts of strange wares. Of course some of them Brygida knew, particularly foods and fabrics, but other things were as strange to her as rifles and railroads might be to someone that had visited the Cappadocia of her day one hundred and ten years from the past. The two made their way through the bazaar, unmolested with no one thinking it odd that a fluffy, gray cat should be leading a little girl around as if it was perfectly typical that a feline led a girl around like a hound might lead a hunter. They stepped out of the covered bazaar and looked upon a mosque unlike any that Brygida had ever seen. Though smaller than the Hagia Sophia in Istanbul, it was much brighter and had images of people on it – which was something she had heard Allah forbade. It was covered with colorful, shiny tiles, and life-like paintings of bearded figures rested in some of the niches. The tops of the golden minarets were so bright that Brygida had to shield her eyes. Workers were busy running around the courtyard, scrubbing the ground, the fountains, and repainting the wrought-iron fence while men in uniform hung flags: a green-white-red flag with what looked like a sword in the middle and a flag with red and white stripes and fifty stars on a dark blue rectangle in the corner. “What Islamic celebration is this?” Brygida asked, thinking of how in her own town the only celebrations with flags permitted were inevitably Islamic or Ottoman, which were one and the same to the Greeks. “It is for a summit of the President of the United States and the President of the Islamic Republic of Iran,” Rubinka explained while sticking her tongue out and yawning, and then scampering to the fountain in the courtyard of the Imamzadeh Saleh – which was the name of the mosque-like shrine. “Oh!” Brygida answered, admiring the reflection of the shrine in the fountain’s water even as the ripples from Rubinka’s drinking blurred the image. They stepped inside the shrine, Rubinka wiping her paws on a carpet and Brygida taking off her sandals. The interior seemed like a million lights, for the walls and ceiling were a wave of angled crystal. For a girl who grew up in the rough-hewn caves of Cappadocia where crude paintings and mildew dominated the interior, the shrine was like an oasis amidst the desert, or a cavern of diamonds. Men were hanging up what were clearly children’s drawings showing rainbows, people shaking hands, and hearts. “More decorations for the summit,” Rubinka explained. There was so much that Brygida did not understand, including what a summit was. Or what the United States or Iran were. She only knew of two or three countries: Greece, the Ottoman Empire, and Russia. Brygida tugged at her light brown hair that almost reached to her waist, and began to tie braids between her fingers. The cat understood the girl’s confused looks. “The Islamic Republic of Iran and the United States of America are great enemies. Or were, until very recently. One good deal led to another, and now for the first time in many generations the President of the United States of America is coming to visit my country of Iran, which is also known as Persia. We will give the distinguished visitor beautiful carpets of the finest silk, nuts as tasty as fresh salmon, and he will hear me purr as loud as the nuclear missiles that he does not have to worry about!” The cat forgot that the Greek-Turkish girl had no idea what a nuclear missile was. Rubinka stopped purring and licked her tail, but did not answer. Brygida would go home, but the girl’s future would be rather less peaceful than the cat’s present. Nonetheless, the cat kept her mouth closed but for licking the girl’s fingers; for whatever calamities might befall her people and the world, none of it was worth ruining a good petting. This entry was posted in Writing and tagged cappadocia, carpets, cat, Iran framework agreement, Iran nuclear deal, Paws of Persia, tehran, time travel. Bookmark the permalink. Very nice story and pictures! The timetravelling speaking Persian cat is great! though the name Rubinka doesn’t sound Persian. When will sequence two arrive of the Rubinka and Brygida stories? Thanks SD for the nice comment. I don’t know if there will be a sequel. It depends on the next nuclear treaty maybe? But time traveling cats can go anywhere. As for the name of the cat, it’s quite normal to give cats funny names! Especially ones that are foreign.